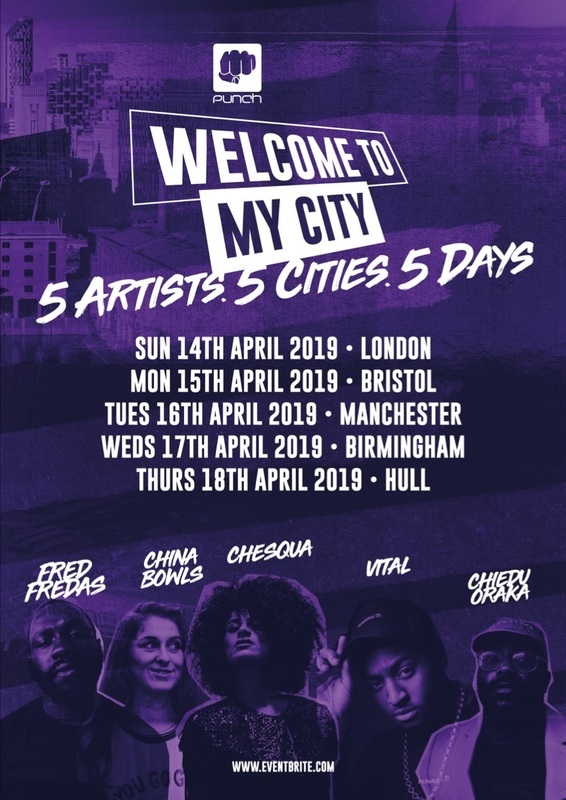 Punch Records’ Welcome to My City tour returns for its third year in April with five up-and-coming music artists visiting five UK cities, each headlining their hometown. This year Chiedu Oraka (Hull), China Bowls (Bristol), Fred Fredas (London), Chesqua (Manchester) and VITAL (Birmingham) get the chance to welcome their peers to their neighbourhoods. We caught up with Fred Fredas to find out how he got involved and what London means to him. I love performing in London because it is my home and it has birthed some of the greatest artists in the world, representing London on this tour is an honour. 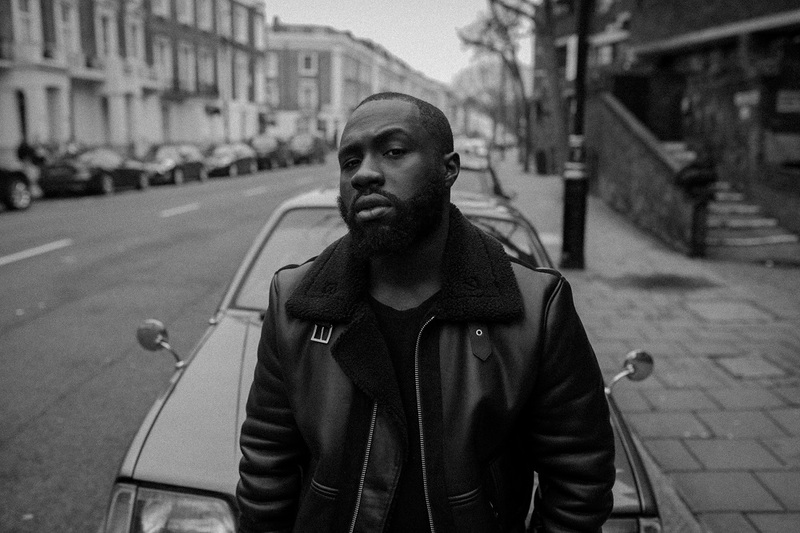 My name is Fred Fredas and I am a rapper/songwriter from South East London. I started to engineer for other artists in a youth studio from the age of 13. The main reason why I started engineering in the studio was so that I could learn how to use the equipment, at the time I lacked confidence in myself as an artist, but I knew that this was something that I wanted to do, therefore I promised myself that I would be the best at it and never give up. This is how my journey into music started. Artists such as Jay-Z, Nas, Andre 3000, Robert Glasper and Big Pun have inspired my style as a musician, particularly with the way these artists present themselves lyrically and through their sound. I remember listening to Nas’ album Illmatic when I was 16-years-old and being so curious about the way he was able to be so sharp with his words. This then went on to shape the way I will tell stories in my songs. I like to take my listeners on a journey with my music through storytelling. My musical style can be described as hip hop with elements of RnB and soul. If I could collaborate with any artist currently it would be H.E.R. Her style and approach to music is incredible, I am confident that a combination of my style and her musical genius it will lead to a legendary master piece that will stand the test of time. Tell us about Welcome to My City. How did you get involved? Punch Records reached out to me, they found out about me through PRS and my headline show at the Roundhouse that I put on in June 2018. They asked me if I wanted to get involved with the tour and for me it was a no brainer, I said yes, as it is an amazing opportunity. The festival sees you play five cities, including your hometown. How does it feel to be representing London? How would you describe your relationship to London? I was born and raised in London and experiences that I have had growing up here have shaped me into the person I am today. How will you welcome your fellow Welcome to My City acts to London? I will welcome them with love as I am sure they will do the same for me in their hometown. The audience are going to love them and will also welcome them with open arms. What are you expecting from them in their hometowns? I am expecting to see amazing talent, passion and greatness on stage. As their representing their hometown I know they are going to give their best and I am looking forward to sharing the stage with them. Which city or cities are you most looking forward to visiting? I am looking forward to all the cities, I can’t wait to meet and share my music with amazing people outside of London. This year I am focused on releasing a lot of content so be ready for a lot music. I am also working on my next EP and a few music videos to go along with it. Don’t worry, everything will make sense eventually, keep on going and don’t watch nobody because like it or not it’s only going to slow you down so keep your head up and focus on being great. This is something I would say to my 13-year-old self. Fred Fredas kicks of Welcome to My City with a show at London’s Underbelly on Sunday, April 14th (tickets here). The event then visits Bristol’s The Louisiana on Monday, April 15th (tickets here), Jimmy’s in Manchester on Tuesday, April 16th (tickets here), The Flapper in Birmingham on Wednesday, April 17th (tickets here) and The New Adelphi Club in Hull on Thursday, April 18th (tickets here). Listen to Fred Fredas on SoundCloud here.